The Debate Society at The Sixth Form College, Solihull took part in a debating competition last week. 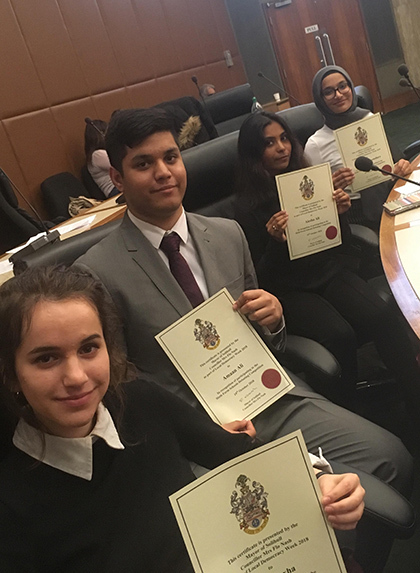 As part of Local Democracy Week 2018, four College students attended this schools debating competition, with teams of other sixth form students from across Solihull. The event took place at the Council Chambers in Solihull on Friday 19 October. The team, consisting of Amaan Ali, Aiesha Ali, Thanzeela Chowdury and Neila Hoxha enjoyed debating topics such as, “whether CCTV is a breach of privacy” and “whether Higher Education should be free”. The quartet of students debated very well and Amaan Ali was asked to be the Chair for the final. This experience was an excellent taster session for the students as they prepare for the Schools MACE debating competition later on into the year.